This vintage cut out is a calendar top made from sturdy pressed paper. 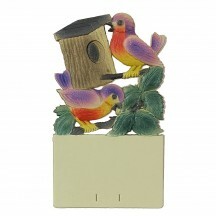 It features two baby birds at a bird house and has heavy embossing and carefully airbrushed color. Made in Germany and measures 7-1/4" tall x 4-1/4" wide. This is old stock form a now closed factory so quantities are limited. Use as table-top decor, behind small Christmas trees, or use in paper crafting projects. This vintage cut out is a calendar top made from sturdy pressed paper. 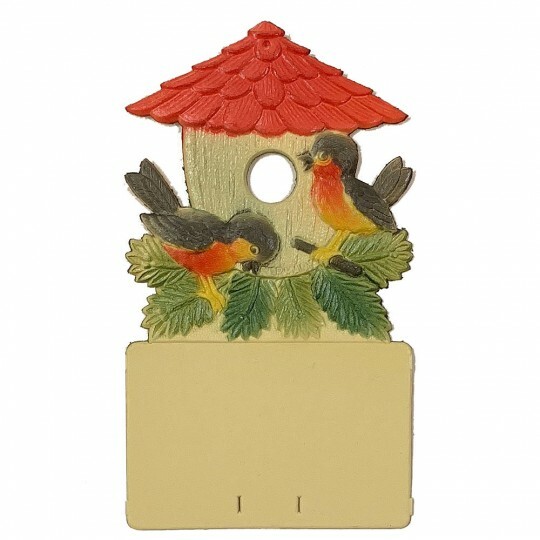 It features two birds at a bird house and has heavy embossing and carefully airbrushed color. Made in Germany and measures 7-1/4" tall x 4-1/4" wide. This is old stock form a now closed factory so quantities are limited. Use as table-top decor, behind small Christmas trees, or use in paper crafting projects. This vintage cut out is a calendar top made from sturdy pressed paper. It features a black cat with a bird and mushrooms and has heavy embossing and carefully airbrushed color. 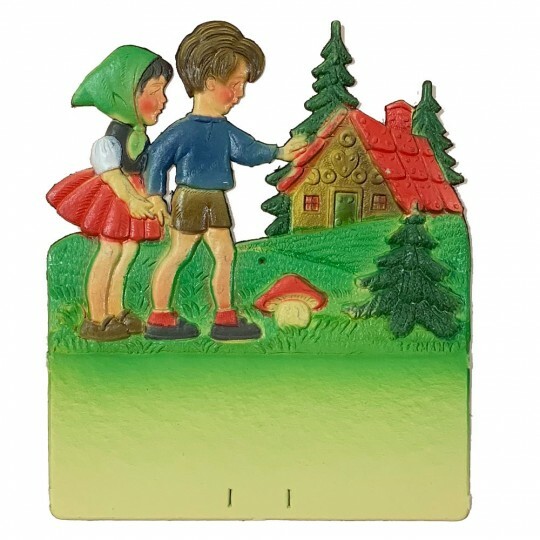 Made in Germany and measures 7-1/2" tall x 6-1/4" wide. This is old stock form a now closed factory so quantities are limited. Use as table-top decor, behind small Christmas trees, or use in paper crafting projects. 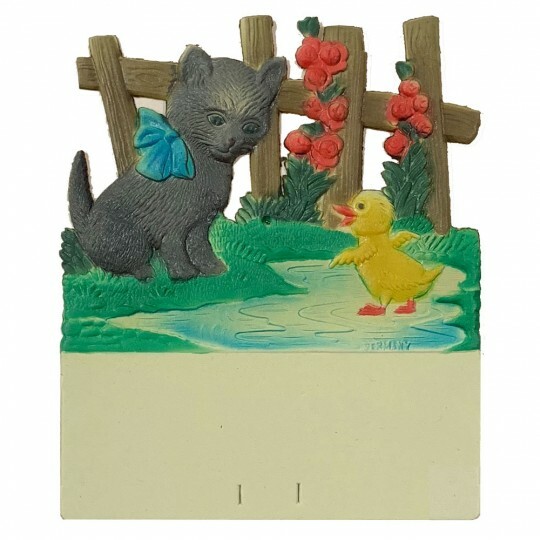 This vintage cut out is a calendar top made from sturdy pressed paper. 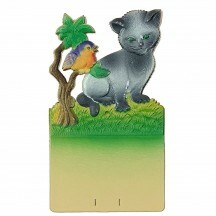 It features a cat with a bird and has heavy embossing and carefully airbrushed color. 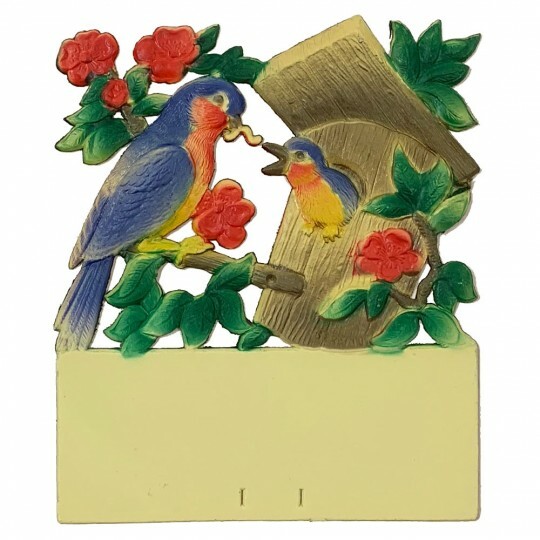 Made in Germany and measures 7-1/4" tall x 4-1/4" wide. This is old stock form a now closed factory so quantities are limited. Use as table-top decor, behind small Christmas trees, or use in paper crafting projects. This vintage cut out is a calendar top made from sturdy pressed paper. It features a cat with a duckling in a puddle and has heavy embossing and carefully airbrushed color. Made in Germany and measures 7-1/2" tall x 6-1/4" wide. This is old stock form a now closed factory so quantities are limited. Use as table-top decor, behind small Christmas trees, or use in paper crafting projects. This vintage cut out is a calendar top made from sturdy pressed paper. 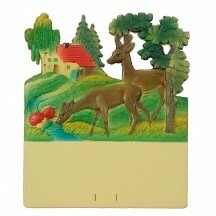 It features deer at a stream and has heavy embossing and carefully airbrushed color. Made in Germany and measures 7-1/4" tall x 4-1/4" wide. This is old stock form a now closed factory so quantities are limited. 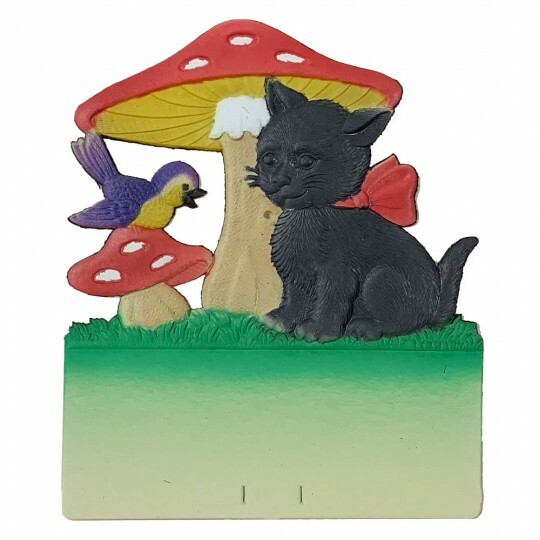 Use as table-top decor, behind small Christmas trees, or use in paper crafting projects. This vintage cut out is a calendar top made from sturdy pressed paper. 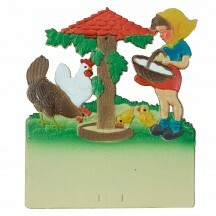 It features a girl feeding chickens and has heavy embossing and carefully airbrushed color. Made in Germany and measures 7-1/2" tall x 6-1/4" wide. This is old stock form a now closed factory so quantities are limited. 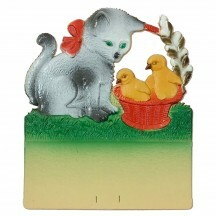 Use as table-top decor, behind small Christmas trees, or use in paper crafting projects. This vintage cut out is a calendar top made from sturdy pressed paper. It features a girl feeding carrots to a horse and has heavy embossing and carefully airbrushed color. Made in Germany and measures 7-1/2" tall x 6-1/4" wide. This is old stock form a now closed factory so quantities are limited. Use as table-top decor, behind small Christmas trees, or use in paper crafting projects. This vintage cut out is a calendar top made from sturdy pressed paper. 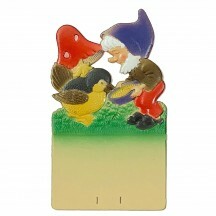 It features a gnome feeding a bird and has heavy embossing and carefully airbrushed color. Made in Germany and measures 7-1/4" tall x 4-1/4" wide. This is old stock form a now closed factory so quantities are limited. Use as table-top decor, behind small Christmas trees, or use in paper crafting projects. This vintage cut out is a calendar top made from sturdy pressed paper. 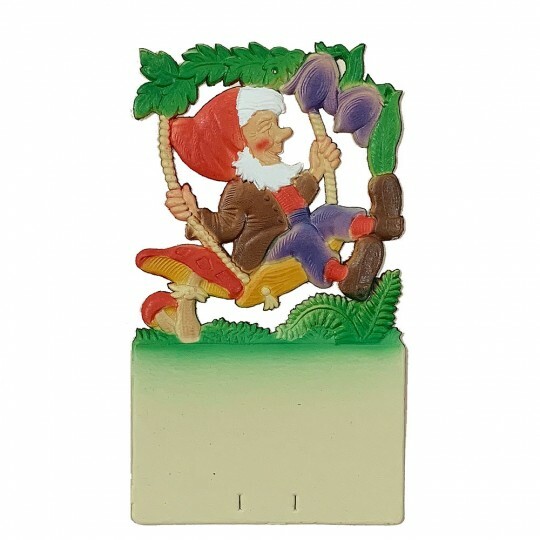 It features a gnome on a swing and has heavy embossing and carefully airbrushed color. Made in Germany and measures 7-1/4" tall x 4-1/4" wide. This is old stock form a now closed factory so quantities are limited. Use as table-top decor, behind small Christmas trees, or use in paper crafting projects. This vintage cut out is a calendar top made from sturdy pressed paper. 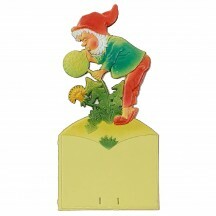 It features a gnome blowing a dandelion and has heavy embossing and carefully airbrushed color. Made in Germany and measures 9-5/8" tall x 4-3/4" wide. This is old stock form a now closed factory so quantities are limited. Use as table-top decor, behind small Christmas trees, or use in paper crafting projects. This vintage cut out is a calendar top made from sturdy pressed paper. 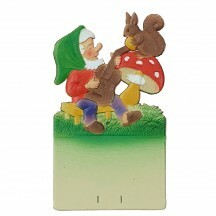 It features a gnome playing music for a squirrel on a mushroom and has heavy embossing and carefully airbrushed color. 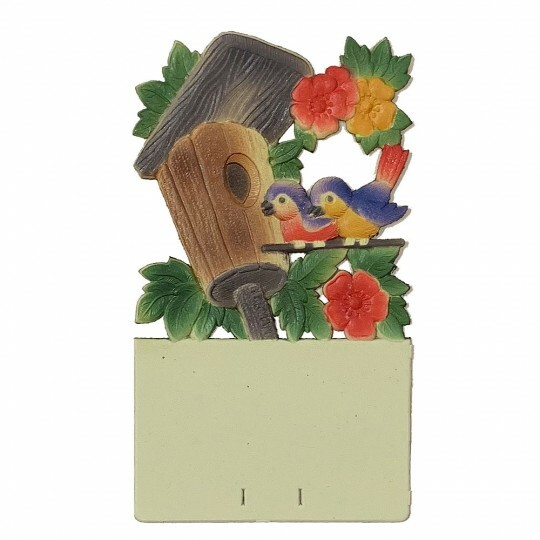 Made in Germany and measures 7-1/4" tall x 4-1/4" wide. This is old stock form a now closed factory so quantities are limited. Use as table-top decor, behind small Christmas trees, or use in paper crafting projects. 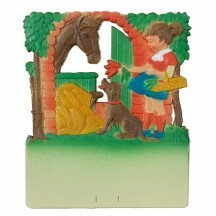 This vintage cut out is a calendar top made from sturdy pressed paper. 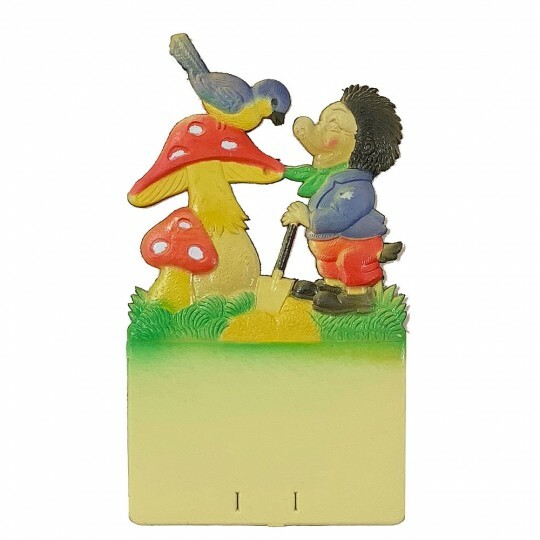 It features Hansel and Gretel and has heavy embossing and carefully airbrushed color. Made in Germany and measures 7-1/4" tall x 4-1/4" wide. This is old stock form a now closed factory so quantities are limited. 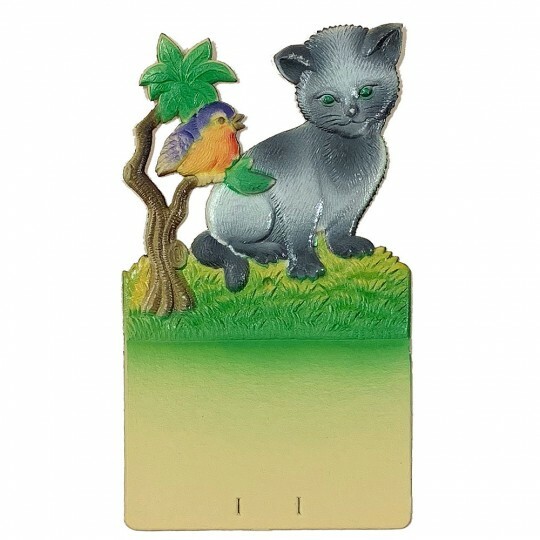 Use as table-top decor, behind small Christmas trees, or use in paper crafting projects. This vintage cut out is a calendar top made from sturdy pressed paper. It features a hedgehog and bird with mushrooms and has heavy embossing and carefully airbrushed color. Made in Germany and measures 7-1/4" tall x 4-1/4" wide. This is old stock form a now closed factory so quantities are limited. Use as table-top decor, behind small Christmas trees, or use in paper crafting projects. This vintage cut out is a calendar top made from sturdy pressed paper. It features a mama bird feeding a baby at a bird house and has heavy embossing and carefully airbrushed color. Made in Germany and measures 7-1/2" tall x 6-1/4" wide. This is old stock form a now closed factory so quantities are limited. Use as table-top decor, behind small Christmas trees, or use in paper crafting projects.